World-renowned Italian Executive Chef and Restauranteur, Toni Rossetti, will delight guests with his delectable dishes and an exciting showcase with our very own Executive Chef Denis Vecchiato in a culinary master's ring of North versus South Italy. 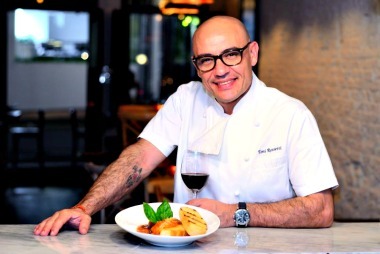 In the fine tradition of gastronomy and wine Sofitel Philippine Plaza Manila celebrates a new chapter in culinary excellence with new Executive Chef, Denis Vecchiato. Stepping to the forefront in a featured special on culinary heritage, Chef Denis Vecchiato and visiting Italian Chef from Singapore’s Noti, Chef Toni Rossetti slips on their chef’s hats and face each other in the kitchen and serve up a taste of Italy. North meets South in a culinary showdown as Chefs Denis Vecchiato and Toni Rossetti present the finest dishes from their regional hometowns in a cook off of masters. Set amidst the featured Barbecue Buffet of Sunset Bar, guests may enjoy culinary specialties and witness an amazing artisan’s showcase. Set from 6.30pm to 10.30pm in the picturesque Sunset Bar, rate is set at Php2,500nett per person. The voyage of taste continues with the featured rich flavors of Italian cuisine highlighted in the featured selection of the most interactive dining destination, Spiral. Chef Toni Rossetti shares his mother’s favorite recipes and dishes borne from his culinary expertise in an enriched selection enhanced by a selection of Italian wine from June 14 – 21, 2015. And for gastronomes looking to sharpen their cooking skills, tie on your aprons and prepare to whip up delectable Italian dishes under the tutelage of Chef Toni Rossetti. An exclusive engagement featuring private cooking classes for a group of 6 to 10 participants, the class will be held from 3pm to 6pm culminating in a sumptuous dinner at the Chef’s table at Spiral on June 16 and 17, 2015. Rate is set at Php3,000nett per person. Kindly make your reservations early to guarantee booking. You may also call +63-2 832 6988 or email H6308-fb12@sofitel.com. Sofitel is the only French luxury hotel brand with a presence on five continents with 120 addresses, in almost 40 countries (more than 30,000 rooms).